Manchester city council is hoping to work with police to see if anti-hate laws can be used to ban homophobic protesters from next year's Pride march. The city's parade was held last Saturday but was attended by a small group of Christian protesters who carried placards warning marchers to "stop sinning". They picketed the parade on Deansgate as around 100 floats passed and shouted chants of "sinful" and "wicked". 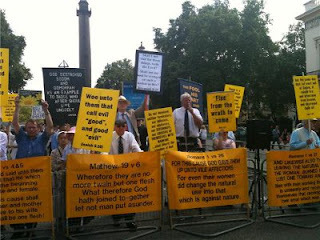 Some of the 20 protesters were thought to be from controversial pressure group Christian Voice and the placards were similar to those carried by protesters at London Pride in July. Pat Karney, the council’s city centre spokesman, told the Manchester Evening News that council chiefs would talk to police to avoid similar scenes in future years. He said: "I will be meeting organisers and police to make sure that next year people are not subject to these vile, hate-filled rantings. "This is 2010, not 1950, and young gay men and women should not be subjected to this hatred. We have a proud history in Manchester of freedom of speech but there is no place for this. "I am a Christian and I believe that these people are a terrible advert for Christianity. "There are things we can do using hate laws to make sure they do not come back." However, Stephen Green, the national director of Christian Voice, told the newspaper: "It is a very sad day for this country when the authorities want to clamp down on the teachings of the Gospel. "This is a major assault on freedom of speech." Mr Green recently attacked gay rugby star Gareth Thomas for "promoting" homosexuality to children. Last month, Channel 4 was criticised for giving him a five-minute programme in which he aired his views about homophobia.